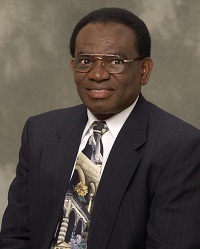 Dr. Nsofor is a full professor in the Department of Mechanical Engineering and Energy Processes. His research is mainly on advanced energy systems including analysis, storage, utilization and recovery. He has been funded by a variety of agencies on projects involving experimental investigations and computer modeling. He teaches related computational and experimental courses, has authored several peer-reviewed papers and advised and graduated many masters and doctoral students. He is a reviewer for reputable journals that include International Journal of Heat and Mass Transfer, Journal of the International Solar Energy Society, Applied Thermal Engineering, Experimental Thermal and Fluid Science and Journal of Thermophysics and Heat Transfer. He is a Senior Member of AIAA and a member of ASME, ASHRAE, ASEE and ASTFE. Ph.D. Mech. Engineering, Mississippi State University, MS, U.S.A.
M.S. Mechanical Engineering, Ahmadu Bello University, Zaria, Nigeria. B.S., Mechanical Engineering, University of Lagos, Lagos, Nigeria. Outstanding Professor of the year Award for the Department of Mechanical Engineering and Energy Processes, Southern Illinois University, Carbondale for 2001 – 2002. Mahdi, J. M. and Nsofor, E. C., 2017, “Solidification Enhancement in a Triplex-Tube Latent Heat Energy Storage System using Nanoparticles-Metal Foam Combination”, Energy, Vol. 126, pp. 501-512. Mahdi, J. M. and Nsofor, E. C., 2017, “Melting Enhancement in Triplex-Tube Latent Heat Energy Storage System using Nanoparticles-Metal Foam Combination”, Applied Energy, Vol. 191, pp. 22-34. Mahdi, J. M. and Nsofor, E. C., 2017, “Melting Enhancement in a Triplex-Tube Latent Thermal Energy Storage System using Nanoparticles-Fin Combination”, The International Journal of Heat and Mass Transfer, Vol. 109, pp. 417-427. Mahdi, J. M. and Nsofor, E. C., 2016, “Solidification of a PCM with Nanoparticles in Triplex-Tube Thermal Energy Storage System”, Applied Thermal Engineering, Vol. 108, pp. 596-604. Conteh, M. A. and Nsofor, E. C., 2016, “A Symmetric Angle-Ply Composite Flywheel for High-Speed Energy Storage”, Transactions of the ASME: Journal of Engineering Materials and Technology, Vol. 138, No. 2, pp. 1-7. Mahdi, J. M. and Nsofor, E. C., 2016, “Melting of PCM with Nanoparticles in a Triplex-Tube Thermal Energy Storage System”, ASHRAE Transactions: Research, Vol. 122, Part. 2, pp. 215-224. Conteh, M. A. and Nsofor, E. C., 2016, “Composite Flywheel Material Design for High-Speed Energy Storage”, Journal of Applied Research and Technology, Vol. 14, pp. 184-190. Conteh, M. A. and Nsofor, E. C., 2014, “A Study on Flywheel Energy Recovery from Aircraft Brakes”, Journal of Multidisciplinary Engineering Science and Technology, Vol. 1, No. 5, pp. 268-272. Celik, S., and Nsofor, E. C., 2014, “Performance Analysis of a Refrigerating System with a Grooved-Tube Evaporator”. Applied Thermal Engineering, Vol. 73, No. 1, pp. 743-748. Herek, S. J. and Nsofor, E. C, 2014, “Performance of Vacuum Insulation Panels in Building Energy Conservation”, American Journal of Engineering Research, Vol. 3, No. 7, pp. 149-160. Christianson, E. and Nsofor, E. C, 2014, “A Study on Materials for Improved Energy Conservation in Buildings”, Energy Engineering, Vol. 111, No. 6, pp. 7-21. Alajo, O. S., Ibekwe, V. C. and Nsofor, E. C, 2013, “Experimental Study on the Performance of a PCM-Based Solar Energy Storage System”, American Journal of Engineering Research, Vol. 2, No. 11, pp. 195-203. Kadam, R., Nsofor, E. C. and Dillard, B., 2012, “Net-Zero Energy Study for a Multi-Purpose Building” International Journal of Science and Technology, Vol. 2, No. 8, pp. 532-538. Vishwanadula H. and Nsofor, E. C, 2012, “Studies on Forced Convection Nanofluid Flow in Circular Conduits”. ARPN Journal of Engineering and Applied Sciences, Vol. 7, No. 3, pp. 371 - 376. Celik, S., and Nsofor, E. C., 2011, “Studies on the Flow-Induced Noise at the Evaporator of a Refrigerated System”. Applied Thermal Engineering, Vol. 31, No. 14-15, pp. 2485 – 2493. Nsofor, E. C. and Vijay, V., 2011, “Piping Insulation Model for Energy Conservation in Buildings”, Energy Engineering, Vol. 108, No. 3, pp. 37 - 50. Nsofor, E. C. and Vijay, V., 2010, “Boiler Energy Conservation Performance Studies in a Commercial Facility: Setting the Stage for Cogeneration and Distributed Generation”, Cogeneration and Distributed Generation Journal, Vol. 25, No. 4, pp. 64 - 79. Nsofor, E. C. and Ali, A., 2009, “Experimental study on the thermal response of the thermoacoustic refrigerating system”, Applied Thermal Engineering, Journal, Vol. 29, No.13, pp 2672 - 2679. Nsofor, E. C., Celik, S. and Wang, X., 2007, “Experimental study on the heat transfer at the heat exchanger of the thermoacoustic refrigerating system”, Applied Thermal Engineering, Vol. 27, pp 2435 - 2442. Nsofor, E. C., 2008, “Recent Patents on Nanofluids (Nanoparticles in Liquids) Heat Transfer”, Journal of Recent Patents on Mechanical Engineering, Vol. 1, No.3, pp 190 - 197. Nsofor, E. C., 2005, “Investigations on the Packed Bed for High-Temperature Thermal Energy Storage”, International Journal of Green Energy, Vol.2, No.4, pp. 337-352. Nsofor, E. C. and Gurijala, P. R., 2005, “Studies on the Gas-Stack Heat Transfer for Research and Development of the Thermoacoustic Refrigerating System”, ASHRAE Transactions, Vol. 111, Pt. 1 pp. 416 - 422. Nsofor, E. C., 2004, “Energy Consumption and Savings Model for Cogeneration in Commercial Buildings”, Cogeneration and Distributed Generation Journal, Vol. 19, No. 3, pp 62 - 74. Nsofor, E. C. and Vijay, V., 2004, “Modeling of Energy Conservation for HVAC Chiller Use in a Commercial Facility”, Energy Engineering, Vol. 101, No. 3, pp. 35 - 49. Nsofor, E. C. and Adebiyi, G. A., 2003, “Forced Convection Gas-to-Wall Heat Transfer in a Packed Bed for High-Temperature Energy storage”, Experimental Heat Transfer, An International Journal, Vol. 16, No. 2, pp. 81 - 95. Nsofor, E. C. and Adebiyi, G. A., 2001, “Measurements of the gas-particle convective heat transfer coefficient in a packed bed for high-temperature energy storage”, Experimental Thermal and Fluid Sciences, Vol. 24, No. 1-2, pp 1-9. Adebiyi, G. A., Nsofor, E. C., Steele, W. G. and Jalalzadeh-Azar, A. A., 1998, “Parametric Study on the Operating Efficiencies of a Packed Bed for High-Temperature Sensible Heat Storage”. ASME Journal of Solar Energy Engineering, Vol. 120, pp. 1 - 12. Adebiyi, G. A., Hodge, B. K., Steele, W. G., Jalalzadeh-Azar, A. and Nsofor, E. C., 1996, "Computer Simulation of a High Temperature Thermal Energy Storage System Employing Multiple Families of Phase-Change Storage Materials”. ASME Journal of Energy Resources Technology, Vol. 118, No. 2, pp. 102 - 111. Mahdi, J. M. and Nsofor, E. C., 2017, “Solidification of PCM in Triplex-Tube Thermal Energy Storage System using Fins and Nanoparticles Enhancement”, Technical Paper presented at the 2nd Thermal and Fluids Engineering Conference and 4th International Workshop on Heat Transfer and published in the Proceedings, Las Vegas, Nevada, April 2-5, 2017. Mahdi, J. M. and Nsofor, E. C., 2016, “Melting of PCM with Nanoparticles in a Triplex-Tube Thermal Energy Storage System”, Technical Paper Presented at the 2016 ASHRAE Annual International Conference, St. Louis, MO, June 25-29, 2016. Conteh, M. and Nsofor, E. C., 2014, A Symmetric Angle-Ply Composite Flywheel Study for High-Speed Energy Storage Technical paper presented at the 2nd International Conference and Exhibition on Mechanical & Aerospace Engineering, Philadelphia, PA, September 08-10, 2014. Conteh, M. and Nsofor, E. C., A Flywheel Energy Recovery and Storage System for Aircraft Brakes. Paper presented at the conference and published in the proceedings of the 49th AIAA/ASME/SAE/ASEE Joint Propulsion Conference & Exhibit and 11th International Energy Conversion Engineering Conference, San Jose, CA, July 15-17, 2013. Nsofor, E. C., Celik, S. and Wang, X. Forced Convection Heat Transfer at the Heat Exchanger of the Thermoacoustic Refrigerating System. Presented and Published in the Proceedings of the 9th Joint ASME/AIAA Thermophysics and Heat Transfer Conference, San Francisco, CA, June 5-8, 2006 as Paper No. AIAA-2006-3807. Kantipudi, R., Nsofor, E. C. and Chugh, Y. P. CFD Modeling of Airflow Distribution around a Room-and-Pillar Mining Face Area. Presented at the Conference and Published in the Proceedings of the 9th International Mine Ventilation Congress, New Delhi, India, November 10–13, 2009. Celik, S., and Nsofor, E. C. Thermal and Acoustical Analysis of Flow-Induced Effects in a Cooling System Heat Exchanger. Paper presented at the Conference and published in the Proceedings of the 5th European Thermal Science Conference and Exhibition, (Eurotherm 2008) Eindhoven, the Netherlands, May 18 – 22, 2008. Celik, S., and Nsofor, E. C. Thermal Analysis of a Grooved Refrigerating Systems Evaporator. Presented at the Conference and Published in the Proceedings of the 5th AIAA International Energy Conversion Engineering Conference and Exhibition, (IECEC) St. Louis, MO, June 25 - 27, 2007 as Paper No. AIAA-2007-4745. Nsofor, E. C., and Ali, A. Thermal Response of Thermoacoustic Refrigerating System to Variable Loading. Presented at the Conference and Published in the Proceedings of the 5th AIAA International Energy Conversion Engineering Conference and Exhibition, (IECEC) St. Louis, MO, June 25 - 27, 2007 as Paper No. AIAA-2007-4775. Nsofor, E. C. and Gurijala, P. R. Studies on the Gas-Stack Heat Transfer for Research and Development of the Thermoacoustic Refrigerating System. Presented at the 2005 ASHRAE International Winter Meeting, Orlando, Florida, February 5-9, 2005. Nsofor, E. C., and Wang, X. Oscillatory Heat Transfer at the Heat Exchangers of the Thermoacoustic Refrigerating System. Presented at the Conference and published in the proceedings of the ASME International Mechanical Engineering Congress & Exposition, Washington, DC, November 16 – 21, 2003. Gurijala, P., and Nsofor, E. C. Experimental Studies on the Gas-Stack Heat Transfer in a Thermoacoustic Refrigeration System. Presented at the Conference and published in the proceedings of the ASME International Mechanical Engineering Congress & Exposition, Washington DC, November 16 – 21, 2003. Nsofor, E. C., Gurijala, P. R. and Jiang, Z. Design, Construction and Heat Transfer Analysis of a Thermoacoustic Refrigeration System. Presented at the Conference and published in the proceedings of the ASME International Mechanical Engineering Congress & Exposition, New Orleans, LA, November 17 – 22, 2002. Nsofor, E. C. and Adebiyi, G. A. Experimental Determination of the Forced Convection Gas-to-Wall Heat Transfer Coefficient in a Packed Bed for High-Temperature Thermal Energy Storage. Presented at the Conference and published in the proceedings of the ASME International Mechanical Engineering Congress & Exposition, New York, NY, November 11 – 16, 2001.